Pants are fine for downhill when your day consists of hanging out in a shade tent and just doing a couple of runs before getting on the podium. But when you're hitting line after line, trail after trail, nothing compares to shorts. 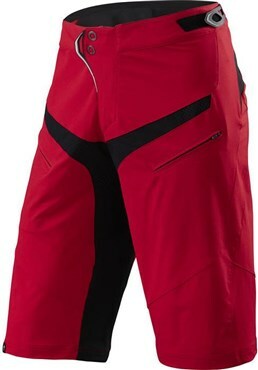 More specifically, nothing compares to our Demo Pro Shorts. We made them from a woven version of our lightweight and ultra-breathable VaporRize™ fabrics. As a result, the shorts are more than tough enough to take repeated spills while you're finding your line (or losing it), without sacrificing anything to comfort. And to further this concept, they also include laser perforated venting that's just as effective at dumping excess heat as mesh, only it doesn't create a weakness in the overall strength of the shorts. In essence, this means that you won't find yourself blowing these shorts out for a long time to come. In terms of fit, you'll find that these shorts are plenty baggy enough to layer body armor and pads, and there are side waist adjustment tabs that keep the waist where you want when the pockets are loaded. And for all-year riding, the Demo Pros also have the added benefit of being treated to be water-repellant.